We all dream. For some, dreams can become reality. H.P. 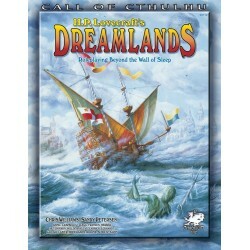 LOVECRAFT'S DREAMLANDS provides everything needed for Call of Cthulhu or Cthulhu Dark Ages investigators to travel down the seven hundred steps, through the Gates of Deeper Slumber, and into the realm of dreams. Includes a travelog of the Dreamlands, a huge gazetteer, Dreamlands character creation rules, over thirty prominent characters, over 60 monsters dwelling within the Dreamlands, descriptions of the Dreamlands gods and their cults, six adventures to help jump start a Dreamlands campaign, and a fold-out map of the Dreamlands by Andy Hopp. Includes the adventures "Pickman's Student"; "The Lemon Sails";" To Sleep, Perchance to Dream"; "Season of the Witch"; "The Land of Lost Dreams"; "Captives of Two Worlds".